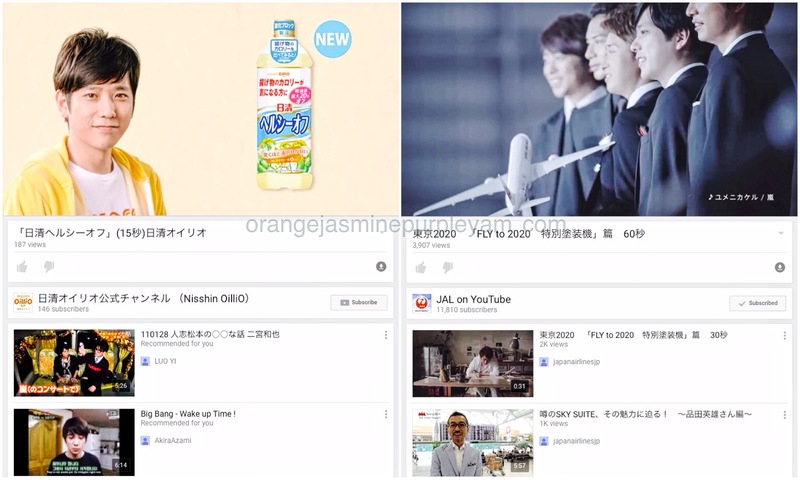 [Arashi] 嵐 has landed on YouTube. You know you’re a J-pop fan when it’s so difficult to find the artists’ videos online, much more on YouTube. Sure, there are those that have official YouTube channels but if you fangirl a Johnny’s, good luck in looking for their videos. Fans even have to be creative in order to upload fanmade videos on YT so it’s like a eureka moment when you accidentally stumble on a video that somehow the auto-censors failed to track down. But it’s a hallellujah moment when Arashi finally lands on YouTube for real and officially. We have Nisshin Oillio and Japan Airlines to thank for that. I wonder though how much Nisshin Oillio and JAL paid J&A to have them bend their strict, archaic rules that ban the use of their artists images online. Or does this mean ushering a new era for J&A when they finally come to terms with technology and social media? And will it be a long stretch to dream that Arashi will one day land on Twitter too? On second thoughts, no thanks. I don’t want them getting exposed to the wild world without Uncle Johnny’s heavy hand LOL. In the meantime, let’s enjoy Nino cooking tempura. Then there’s the whole gang looking at their JAL jet that Riida designed with pride. And because I still can’t believe that Arashi videos are on YouTube now and we can watch them anytime we want without fear of them being taken down suddenly, I went screencap-happy. I still doubt though that we will soon see the day when Arashi or J-Storm will have an official YouTube channel. But letting these commercial videos appear on YT is such a huge leap already so who knows. Thank you Nisshin Oillio and JAL! AHHHHHH IS THIS TRUE??? I can’t believe what I’m reading!!! Thanks for sharing this! Will be checking this out!